I actually took this one a couple of years ago. It’s not photo-shopped. 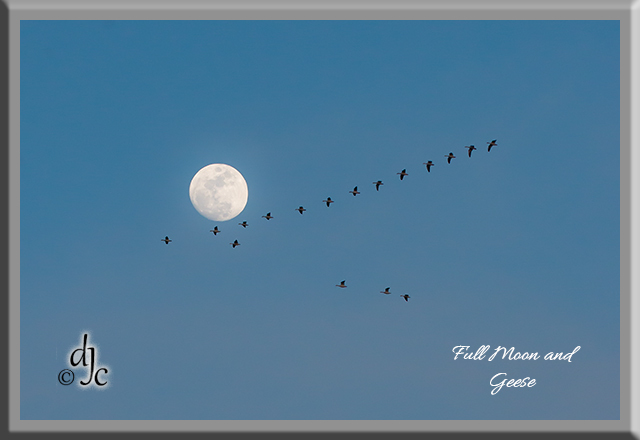 The geese were flying high and I was actually trying to get a full moon shot. Lucky timing. It is pretty heavily cropped. Ich habe dieses vor ein paar Jahren genommen. Es ist kein Foto-Shoppen. Die Gänse flogen hoch und ich versuchte tatsächlich, einen Vollmond zu bekommen. Glückliches Timing Es ist ziemlich stark abgeschnitten.